The Peacock Flounder is one of those fish who finally prove that good looks is totally optional. Sure you got your baby faced dolphins, your streamlined swordfish and your impressive sharks, but lying on the floor beneath them all is something that appears to have lost a battle with a gigantic shoe. It goes by the name Bothus mancus, Peacock Flounder and most fun of all, Flowery Flounder. Flowery Flounder! The flat, Flowery Flounder flops and flails on the floor. How flippant! I'm guessing they get both of their common names from the blue spots which look a bit like flowers and perhaps like the blue eyes on peacock feathers. The thing is, you'd be hard pressed to actually see those blue spots (but hopefully not as hard pressed as they are). Peacock Flounders are the complete opposite of peacocks and flowers. This is no exhibitionist, this is the chameleon of the fish world. The first thing you'll notice is just how much work it takes to notice them. Despite a length of up to 45 cm (18 in), Peacock Flounders are able to disappear into the surrounding sand or rock of their shallow, Indo-Pacific home. They do it with their naturally spotted, speckled and mottled patterns, but they can also change colour in seconds to fully blend in. Going from vibrant blues to light, sandy hues is no problem, and they can even get different parts of their body to be different colours. Their ambition is such that they will even have a go at disappearing into a chessboard! 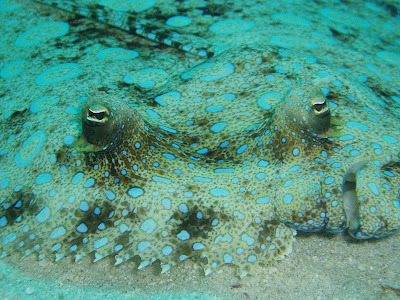 With those black squares, it's clear how the Peacock Flounder looks around to imagine the pattern beneath their own body. And they're really good at it, too! Another aid to going unseen is that they are amazingly flat, but in completely the wrong way. They're lying down on their right side with both eyes on their left side. This is appalling! Baby flounders look like normal fish but their right eye has to move up to the other side of their face as they grow up. And to think that people complain of being confused when they were teenagers! At least you roughly knew where your eyes were pointing. Even if some other bits were a little more wayward. The closely related Bothus lunatus. Almost exactly the same, only from the Atlantic. And those peepers don't get out of the chameleon comparison either. They bulge out of the head and can move independently of each other. Peacock Flounders can look forward and backward all at once. This is good stuff for checking out the colours are required for camouflage. Indeed, while they have 360 degree vision when both eyes are working, they don't have it in each individual eye. So if one eye can't see for any reason, the Peacock Flounder will have real difficulty in sorting out their camouflage. 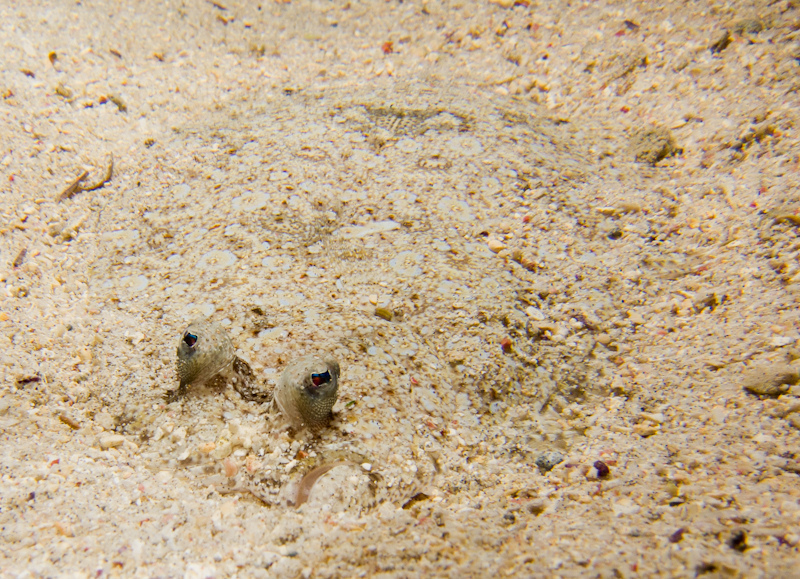 This is why their eyes have to be bulbous enough to stick out above the sand. Sometimes, beauty must be sacrificed for life. Like running out of a burning building even though your hair is a mess. Music by Saint Privat. I think I've instantly become a fan. The Peacock Flounder must make do without a long, sticky chameleon tongue. They got a sideways mouth, though! That's something, right? Yeh. Something. 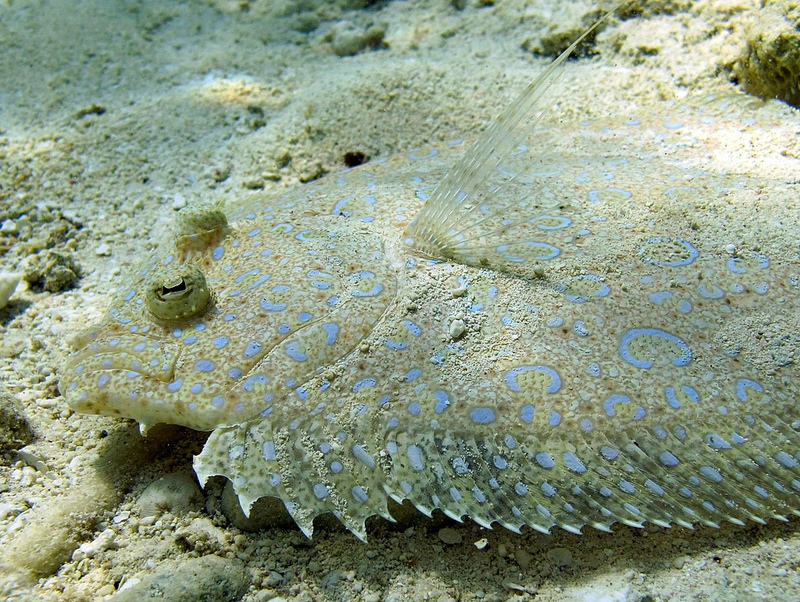 Camouflaged from predator and prey alike, and with eyes continually on the look out, Peacock Flounders simply pounce on small fish and crustaceans. They really didn't see it coming. They'd probably see their eggs though. Females release up to 3 million of them! With numbers like that, it's pretty clear that youngsters are left to get on with their lives. 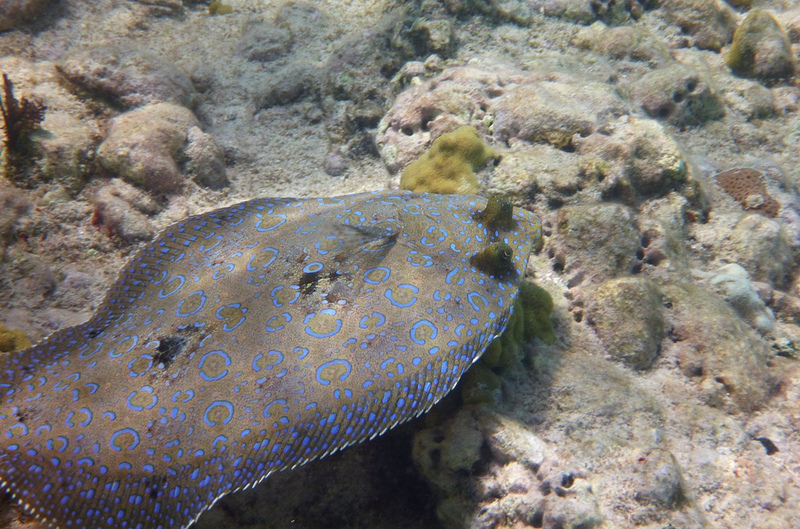 Baby flounders float around for several months, travelling on the currents. Eventually they'll realise that one of their eyeballs has moved to the wrong side of their head and settle down on the ocean floor. Trading the traditional idea of "fish" for something strange and amazing. Bargain! Yes, you wouldn't think they'd grow into such weirdness! When you think about it, it seems impossible for the eye to migrate to the other side of the head. Our eyes are sitting firmly in their sockets. These flounders are pure madness! I cannot imagine "migrating" my right eye to my left cheek without fatal consequences! That's the thought process of us non-Flounders. Of course, you need only look at them to know SOMETHING impossible has happened! Monstrously beautiful! Great info about the fantastic birds including the Indian Peacock, we call it 'maura' or 'maur'. Thanks a lot! Interesting to know your name for the Peacock. At least it's not all peas!